SAIC has purchased two MakaiLay Seismic licenses and one MakaiPlan Pro Seismic license for use in their seismic oil and gas exploration projects. SAIC owns and operates modularized cable engines and cable installation equipment together with well trained and certified MakaiLay operators to install submarine cables worldwide. SAIC often leases vessels of opportunity in the project region with which they deploy the Ocean Bottom Cables (OBCs) or node arrays. The growing interest in Makai’s cable installation tools by the seismic exploration community has begun to translate into software sales. SAIC’s purchase marks the third recent MakaiLay seismic customer. Makai has seen an increasing number of telecom cable installers “hopping the fence” to do seismic and power cable jobs, blurring the lines between the telecom, seismic, and submarine power cable installers. Since more than 75% of the world’s telecom cable installation fleet already uses Makai software products, some of these companies are upgrading to the seismic specific cable installation and planning modules in order to increase their competitiveness in this growing field. MakaiPlan Pro Seismic: is a simulation tool to accurately plan the installation and retrieval of Ocean Bottom Cables (OBC) in mid- and deep waters. It enables powerful and precise 3D, dynamic simulations of the cable installation and retrieval. The operator can quickly simulate an entire cable lay in advance and in his office at 25 to 50 times faster than real-time. The simulations can be used to test the feasibility of the planned lays, make equipment selection, train cable engineers, pre-lay and post-lay analysis, and create a Ship Plan for installation. 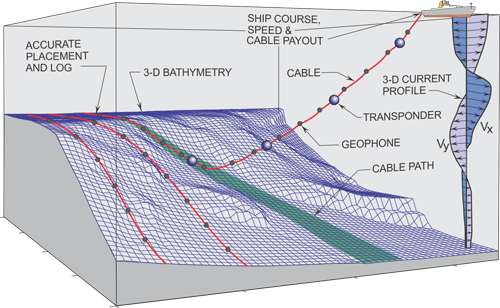 A detailed analysis and simulation is valuable to best understand and plan for dynamic cable situations that occur during speed changes, starts and stops, and hydrophone body deployments. seismic arrays for the oil and gas industry. MakaiLay Seismic builds on the MakaiLay engine, but it includes additional tools specifically designed for the seismic industry to accurately install and retrieve Ocean Bottom Cables (OBC) with many in-line sensors, or node arrays in mid- and deep waters. MakaiLay Seismic is flexible enough to run on laptops and assimilate information from SAIC’s collection of cable installation equipment, including Acoustic Doppler Current Profiler (ADCP) and transponders attached to the cable, and then output vessel navigation and cable payout instructions for the operators. Delivery of the new software and training of operators will be completed in early September 2013.